Cate and I have stuck close to home today. So close I totally forgot I had an appointment with the dentist to fix one of my back teeth that is strangely broken. Anyway, we've been at home because she's congested. I hesitate to say sick, but definitely congested and lacking energy. More tears than usual, but no fever. And she wants to be held more than she wants to play. 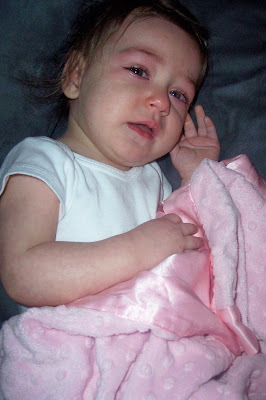 This after she had a fever Tuesday but otherwise acted normal. She started feeling bad (and sounding hoarse in her babble ...) yesterday afternoon. She went to sleep really well last night (right after Jonny Fairplay got voted off of "Survivor." I know, weird vote, huh? I really thought it was a ploy. ), but then she woke up at 1 a.m. I waited a few minutes and it didn't sound like she was putting herself back to sleep, so I went in there, only to find her sitting straight up in her crib. 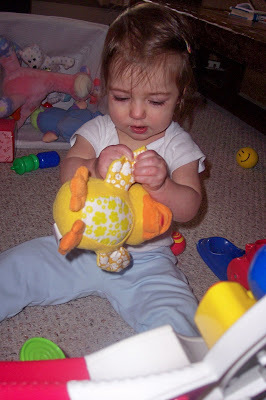 Now, keep in mind, I've never seen her go from laying down to sitting up without help. Maybe she used her crib to help her. Or maybe she just can do that now. Anyway, I rocked her a for a few minutes and then laid her back down, and she was off to sleep again. Speaking of yesterday ... Greg and I met 10 years ago on Feb. 7, 1998. Hard to believe we've known each other for a decade. I'm sure I'll mention it again next week, but we went on our first date on Valentine's Day that year. So now the holiday is affectionately called First-Date Day at our house. Anyway, we're really terrible about keeping gifts surprises very long. So I asked Greg yesterday if I could give him his First-Date Day present a week early, plus it would recognize the anniversary of our meeting through a mutual friend. I bought him the Settlers of Catan Card Game, which can be played with just two players. He's not much for Scrabble and Boggle like me, so I wanted to find something else for us to play in the evenings. Oh, and he gave me the Cricut font I asked for (Jasmine, you scrappers!) and two Five for Fighting CDs. In addition to enjoying my new music, I've been reading some books. In an effort to learn more about nutrition, I'm reading "Eat to Life" by Joel Fuhrmann. And as Greg and I develop our disciplining philosophy, I'm reading (well, we're both reading ...) "To Train Up a Child" by Michael and Debi Pearl. 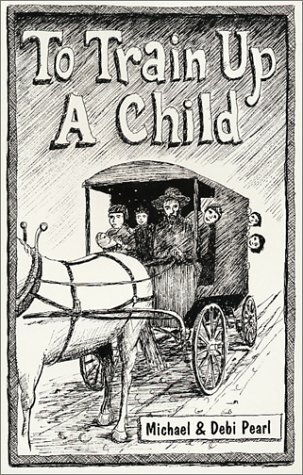 You know, I really agree with a lot of the ideas in that book, despite the dog and mule analogies and the horse-drawn covered wagon drawn on the front. And speaking of food (the book, you know ...), I cooked dinner four nights in a row. (The new kitchen, especially the dishwasher, definitely helps!) On Sunday night, I planned four meals for this week and then went to the grocery to get everything. Successful! All four meals involved a new recipe for the main dish, and all four turned out well. We even ate leftovers for lunch throughout the week. Greg and I really love eating out, so four straight days of eating every meal at home is good for us! A new kitchen will do that to you. We have been eating at home so much more lately. I think it's definately the fact that I don't have to do dishes besides putting them in the dishwasher! Poor Cate. Is she better today? Are you all watching the game? D is. Alright, I've got to check out this Settlers of Catan thing! I thought JF was a ploy too. But i couldn't for the life of me figure out where he was going with it! Have you joined the fantasy Leaque yet?